Sweet, sweet pink and sunny yellow combine in this charmer of a bouquet, perfectly poised to make Mother's Day 2016 more special than ever. 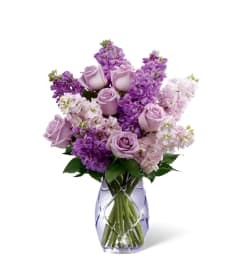 Beautifully composed of harmonizing shades of pink ranging from peach to coral to magenta and highlighted with a happy splash of yellow, it includes roses (in Better, Best and Exquisite versions), LA Hybrid and Peruvian Lilies, mini-carnations, stock and more. 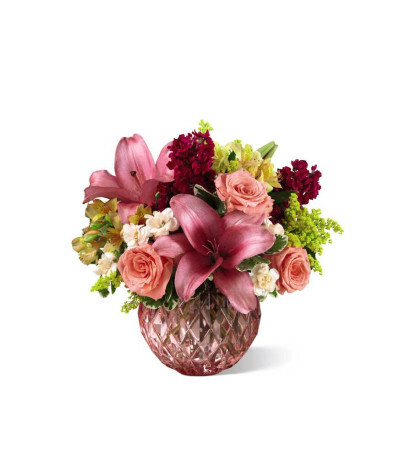 Its vase is a berry bright orb of heavy, faceted glass, sure to be treasured along with the memory of this delightful arrangement. 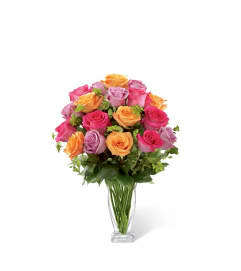 BETTER bouquet is approximately 12"H x 12"W.